Triple H then comes out onto the stage as smoke rises from it, around his waist he's wearing the Intercontinental Championship proudly as he takes a swig from his water bottle then sprays some of the water from his mouth as he walks down the stage and throws it into the crowd. Making his way to the ring, Hunter Hearst Helmsely... 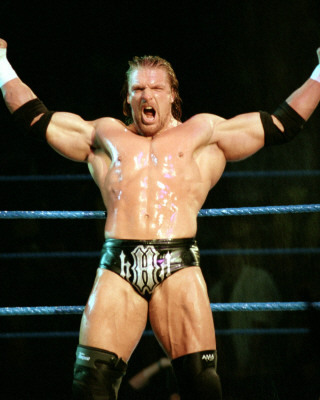 Triple H! The Game has finally made it to the right side of the ring as he gets up onto the ring apron leaning back into his signature pose spraying some more water out and posing as he enters the ring through the middle ropes, as he gets up onto the turnbuckle and poses again as his music stops. Now I'm gonna get straight to the point I'm out here tonight for only one reason and one reason only I'm out here tonight to re create one of the best stables ever and let it be known as D-Generation-X, but trust me it's not gonna be anywhere close to the old D-Generation-X, since Shawn aint around.. so if there's anyone who wants to join come out here now. TBC BY: Anyone who wants to join. "IMA BALL TILL iFALL N' DRINK TILL iCANT"
He Dances his way down the Ring and Climbs the steps going up to the Ring And climbs between the ropes. "Hey Hunter, Nice to see you out here......... So you want to reform DX.... Well That sounds pretty good and all but you wont be in any matches together for a while because I don't think you can work together With someone Else. You and Shawn had somthing special and I don't think you could have that with someone else. I will alow you to Pick someone to Tag with but If you guys don't accomplish somthing within the the first 2 matches then its over. Now Please come to my Gm office if you find someone and If you do we'll be sure to get some air time to bring it to the audience's anntion. A Huge exlposion followed by bright red pyro bursting up from the back of the entrance ramp, Shane and Hunter are stood in the ring, with a confused look on their faces. A shocked Shane stands still as A mysterious figure appears on the stage, dressed in red and black, long brown hair and a red mask. He had to be stood at least 7ft tall, and built like a Rhino. The man has a microphone, bringing it to the slit in his mask, where his mouth is situated. Out of all the possible things i was expecting you to say Hunter, i never thought you would be offering Anyone a spot in DX. I may be forgiven for thinking you had the ego to not care of anyone other then yourself. But i was wrong, and as a punishment, and a reward to you, i would like to personally offer my services as a member of DX. Youve screwed me before, so i think it is a better interest for me to be close to you. Take it or leave it, but im sure Dx could do with a bit of hell fire and brimstone from the Big Red Machine KANE!!! Kane Begins to laugh again as the camera pans to the ring where HHH and Shane look at eachother, with a confused and bewildered look on there faces. Tracking up the ramp at a high angle Kane turns around; back facing the ring, lifting his arms to the ceiling, he throws them down to a roar from the fans, overshadowed by the bright pyro and smoke. With that Kane has left. "Well I didn't see that happening, its up to you hunter.... But I advise to be carefull with who you choose to align your self with,I see many young talent that might better them selves by having you. Im not going to lie, If my body could do it then I would be a member but Ofcoruse Im GM not a wrestler. Don't forget I am GM around here,I AM in power that is a message for everyone who is listening in the back, I am GM and Im going to start making more dicisions, Right now Im helping the chairman because Raw isn't readty to go yet,But Raw is registerd under my name And I will make discions around here.